Apple’s earnings call on April 23 contained some information about the company’s operations, but that news has largely been drowned out by other announcements that Apple made during that call; that it would increase dividends, add to its stock buyback program and split its stock. The market seems to like the bundle, with the stock up more than 13% from its close before the report. But what exactly did we learn about Apple in the report that we did not know already? Is the price rise merited? After the post-report price jump, is Apple fully priced? To address these questions, I am going to draw on some of my earlier posts on Apple and look for a narrative that may explain the market reaction. As some of you who have been reading this blog for a while know, I have a long standing obsession with all things to do with Apple. My first post on Apple was in January 2011, and it was focused on the narrow question of whether companies holding cash should be penalized for holding cash, and I argued otherwise. My next post in March 2012 commemorated two landmarks for Apple, its market capitalization exceeding $500 billion and its cash balance going over $100 billion. I valued Apple at about $700/share but conceded that I was biased both because I loved Apple products and had been a long-term holder of Apple stock. A month later, I got a fair amount of heat for selling my Apple stock at $600/share, though I continued to believe that its value was about $700/share, partly because of what readers viewed as an inconsistency. Value investors are supposed to continue to hold under valued stocks, not sell them. I rationalized my decision in that post and the next one, by presenting a theme that I have returned to several times since, which is that the pricing of a stock can be very different from its valuation and that when a stock becomes a momentum play, value will take a back seat to other factors. Apple’s stock continued to surge in the months after, and in August 2012, I valued just the iPhone franchise, just ahead of the launch of the iPhone 5, just as the stock price crested at $700/share, ahead of that announcement. The market reacted negatively to early news about the iPhone 5, even though it was the most successful smartphone launch in history. My post in October 2012 was centered around how the expectations game for Apple had become skewed to the point that no achievement of the company would be good enough for a market that kept waiting for the next great blockbuster product. At the end of 2012, I revalued Apple, reflecting my downgraded assessments of Apple’s revenue growth and arrived at a value per share of $610/share, about 22% higher than the market price of $500/share at the time. A month later, with the stock at $450/share, I used Apple as a test of my faith in value and argued that my reaction to the market would be a good indicator of whether I was truly a value investor. In the days that followed, I also posted on what Apple could do in response to the pricing collapse and how investors could view and profit from the gap. In February 2013, David Einhorn made a push for Apple to return more cash to its stockholders. Though I disagreed with his plan to use preferred stock to monetize the under valuation,. I agreed with his argument that Apple should return more cash to its stockholders. In April 2013, I revalued Apple at about $590, after their earnings report, where they surprised markets by announcing both an increased stock buyback and their first debt issuance, well above the stock price of $420 at the time of the announcement. The stock continued to slide, hitting a low of $385/share in April. In September 2013, I posted on Apple in the context of separating your love for a company from your assessment of its stock as an investment, and revalued the stock at more than $600/share. The stock had recovered to $500/share by then, but it was still looked under valued to me. Price and Value: Watch the gap! 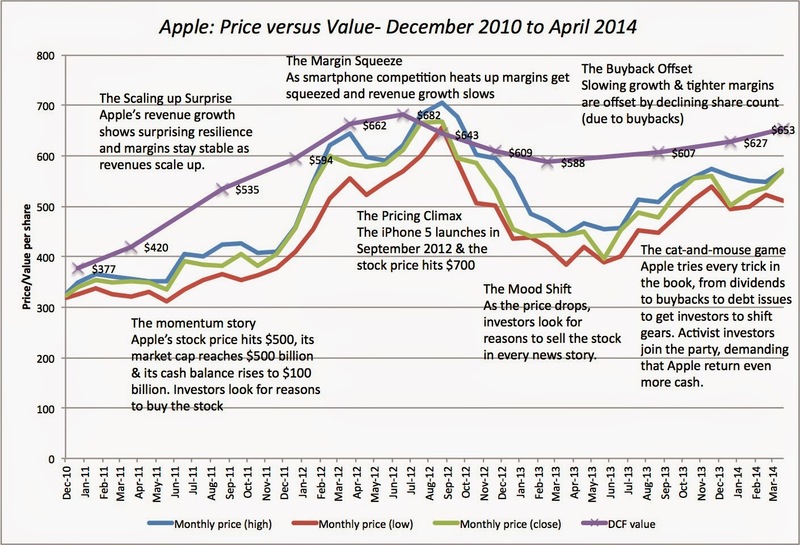 In January 2011, the value that I obtained for Apple was $385 about 13% higher than the price as of that date ($339). Between January 2011 and July 2012, my intrinsic value estimates continued to climb to hit a peak of $686 in July 2012, reflecting primarily the success that Apple was showing in overcoming scale, i.e., managing to grow its revenues and maintain margins, in spite of its size. While the price initially lagged my estimate of value (with the under valuation increasing to 21% in September 2011), it surged thereafter closing the gap in July 2012. In September 2012, the stock price ($667) exceeded my value estimate ($639) for the first time during this period and that represented the pricing peak, as momentum shifted dramatically in the weeks after. The lower revenue growth and margin pressure also reduced my value estimate to $595 in April 2013, but the price dropped to $385 by April 2013 (creating a percentage under valuation of more than 25%). In the months, since there has been a slight uptick in my value estimates to $627 in January 2014 and about $675 in April, partly because of improvements in market mood (a lower equity risk premium) and partly because of reduced share count (due to Apple's buybacks). The price-value gap has closed a little since April 2013, albeit in fits and starts, with the gap standing at about 19.6% just before the last earnings report. If you are interested in delving through the valuations in detail, I have posted all twelve valuations I have done of Apple since January 2011 at the end of this post. If you are suspicious (and you should always should be) that I have back-fit the numbers, you can also check the valuations I posted in my blog in real time. I understand that my valuations reflect my assumptions about the firm and Apple's managers may have very different views about the company. Whatever their perceptions, though, it seems quite clear to me that Apple's managers have believed that the market was undervaluing their stock though their reaction has evolved from an initial indifference to radical (and perhaps even desperate) action. In the first few months, after the iPhone 5 launch, Apple seemed to operate on the conviction that the truth would prevail and that the market would come to its senses and reflect fundamentals. That conviction was tested in early 2013, partly by the continuing drop in the stock price and partly by activist investors (like David Einhorn and Carl Icahn) arguing that Apple should do something with its cash. In April 2013, Apple abandoned its do-nothing stand and announced, in conjunction with its earnings, that it would expand its stock buyback program and borrow money (about $17 billion). The initial market reaction was positive but it quickly faded. In the months since, Apple has tried to stay the course and talk the price up, to mixed effect. The latest earnings report, on April 23, in many ways, reflects Apple's frustration with the persistent gap between price and value. It included almost every catalyst that companies that believe that they are under valued use to attack the gap between price and value: a dividend increase, an increase in the stock buyback program and a 7-for-1 stock split. The market reaction has been euphoric, as the stock price jumped from $525 before the report to $594 (as of today), which raises interesting questions about what investors saw in this report that made them reassess the price. There was little value effect: I revalued Apple, the day after the earnings report, and arrived at a value per share of $648, effectively unchanged from the $649 that I estimated on the day before. That may surprise you, but there was little in the earnings report that changes my view of Apple's operating future: it reported low revenue growth (5%) and continued pressure on margins. The stock buyback and dividends reflect how Apple plans to return cash to its stockholders and has no effect on operating asset value. The stock split is a purely cosmetic event, from a value perspective), since it just changes the number of units (shares) in the company. (In just the last day or so, Apple has announced an additional $17 billion bond issue, which will have a increase the value per share by about $5/share). There was a price effect: While we can make the standard arguments for why the price changed after the report, i.e., that the dividends make investors feel more secure about future cash flows from their Apple stockholdings and that the stocky buybacks are a signal that the company believes that its stock is under valued, those arguments are undercut by the fact that Apple has tried both moves before, with little success in moving the pricing needle. In fact, it may be the stock splits, the one action that almost certainly has no value effect, that may have caused the mood shift. I know that one story that will make the rounds is that the stock split will allow investors who were hitherto unwilling or unable to buy the stock to be able to do so, thus expanding the investor base and improving liquidity. While that story may make sense for a lightly-traded, small cap company, I don't see it holding up to scrutiny when the company that in question is the largest company in the world. In fact, if it turns out (as some news stories are suggesting) that much of the price increase in the last four days has come from institutional holdings expanding, the liquidity argument becomes even weaker. So, here is my explanation, for what its worth. There are lots of reasons for why a gap exists between price and value (as was the case with Apple) and why it persists for long periods but I believe that that the gap is largely driven by investor psychology and market momentum, two forces that are immune to rationality. That is also why it is difficult, if not impossible, for companies to devise plans to make price gaps go away, because these plans are generally based on the assumption that investors will react sensibly to them. If the reaction to the latest earnings report is the shift in momentum that Apple (and its activist investors) have been seeking for the last two years, it is ironic (but not unexpected) that it happened in response to the stock split, the least impactful of Apple's many tries during the period, and not to the more momentous events over that period (which included the launch of new products, acquisitions, buybacks, a debt issue and dividend increases). In my earliest posts on Apple, I argued that the company's success in the last decade and a few missteps, especially in the early part of 2011, had made it a magnet for stockholders of every type: growth, value and momentum. Consequently, the company had a stockholder base that it could never keep happy, since their views of its future (and what it should do with its cash) were contradictory. The last two years have been a painful adjustment process for all of these groups, and the stock price has reflected their turmoil. Growth investors in Apple have reluctantly come around to the point of view that Apple cannot keep growing its revenues at double-digit rates, value investors have found that the stock, in spite of the company's financial strength and profitability, continues to be volatile and momentum investors have discovered that momentum shifts are real and unpredictable. There are some in each group who have moved on to greener pastures and stocks better suited to their investment philosophies and Apple may be benefiting from this pruning of the base. Given my estimate of value of $648/share, I will continue to hold Apple but I have learned to remain vigilant. If the institutional herd thunders back in, now that momentum looks like it is in Apple's favor, they may very well do what they did in the last iteration and drive the price right through the value (or at least my estimate of it). If my biggest problem as an investor is that the price of something I already hold may go up too much, I am blessed! Update: I updated my April 2014 valuations to reflect the current share count of 861.38 million shares, rather that the weighted average share count of 885 million shares that I had used before. That pushes up the current estimate of value to $675/share.